CCSVI or chronic cerebro-spinal venous insufficiency was coined by Dr. Paolo Zamboni, Director of the Centre for Vascular Diseases at the University of Ferrara in Ferrara, Italy. Basically it is a condition where your venous (veins) system is not able to remove the oxygen-poor blood from your central nervous system or CNS. 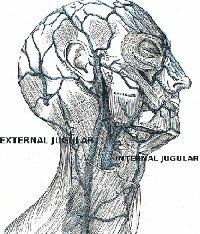 The syndrome usually happens in the jugular veins, both internal and external. It can also happen in the azygos vein. Dr. Zamboni found that in all of the MS patients he tested, these veins were malformed in some way. There was either a blockage, stricture, or a problem with the valves not operating properly. This is not to say that all MSers will have this condition. But according to Dr. Zamboni's small trial, there are definitely a significant number of MSers who share this possible cause of multiple sclerosis. Is this a coincidence? I don't know. Dr. Zamboni was able to see the vein problems using doppler sonography. He saw, in particular, something called venous reflux, where blood flow from the brain actually went backwards. This caused “bad” blood to be pushed back into the brain. As you can imagine, this is not a good thing. What happens as a result of this condition? As a result, there are several things that can happen. One, a condition called hypoxia, is when the body is deprived of oxygen. In this case, the brain, or cerebral hypoxia. This can result in cognitive disturbances and decreased motor control. Another thing that can happen as a result of this are increased iron deposits in the brain. This accumulation of iron in the brain tissue is thought to be the reason for the little white spots which show up in MSers. Something that every one with multiple sclerosis knows about so well. Can it be treated? You can find more here.